TradeMalta’s ‘SME Internationalisation and Export Management Course’ kicks off to a great start! 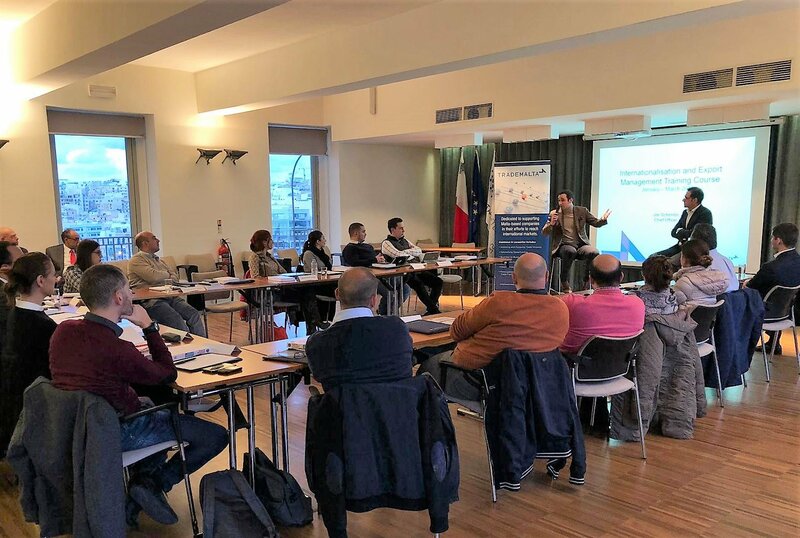 The SME Internationalisation and Export Management Course, organised by TradeMalta, kicked off Wednesday the 23rd of January with 25 participants. The course, which is in its fifth intake, is intended to assist Malta-based companies in their internationalisation efforts. This year sees a number of diverse sectors represented on the course, including engineering, manufacturing, financial services, food, retail and IT amongst others. Participating enterprises will attend the 7-session training course delivered by experts in the field and qualified trainers aimed at creating the correct strategy required to internationalise. Part One incorporates four 3-hour sessions that are aimed at decision makers within enterprises and cover Key Strategic Decisions, Planning and Strategy & Risk. Part Two will include three 3-hour sessions that tackle issues such as the Organizational Set-Up, International Trade Issues, Finance, Marketing and Supply Chain. Workshops and panel discussions involving experience sharing with established exporters are also included. Following the sessions, participants will present an individual assignment to an examiner which will form the basis of their Export Marketing Plans. Following this each individual participant will also attend an Export Clinic during which the examiner will discuss the pitfalls and way forward of each export plan. The course is organised together with Malta University Consulting, with the support of HSBC. For more information contact Mr. Richard Scerri on +356 2247 2414 or richard.scerri@trademalta.org.